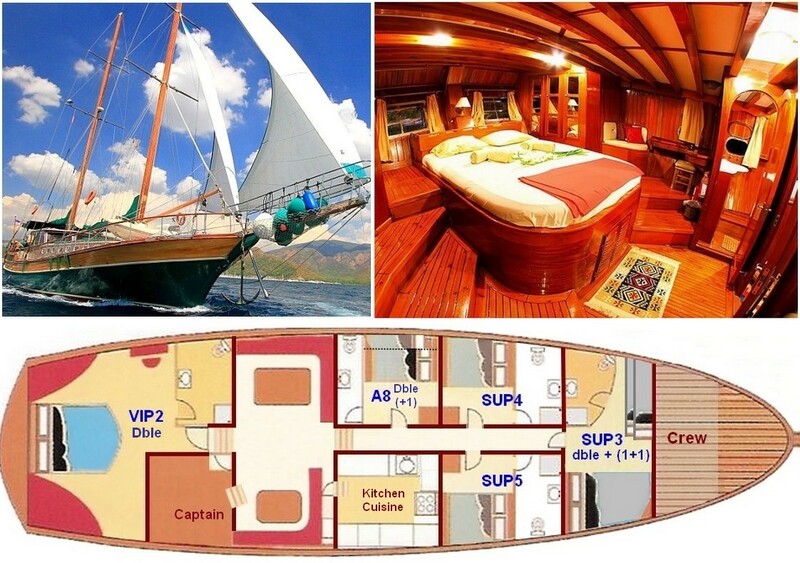 Choose which of our yachts is more suitable for your needs, then see below prices and conditions. Or if you wish to hire by cabin(s) in shared yacht, then follow this link. They sail the Cyclades, the Ionian islands and the Sporades. For your comfort, in July and August we avoid Cyclades which can be very windy during these months. Click here for our current promotions subject to availability. If you are lucky or have flexibility on the dates it can be interesting, if not, these are our prices but always feel free to ask for a quotation. For PDF brochure of 2019 prices this is the link ! ALL PRICES ARE IN EUROS FOR ONE WEEK PRIVATE CHARTER YACHT. If applied, for 'one way' trip or ending in other harbour: delivery, re-delivery lump cost is 33 Euro per nautical mile Base harbor for Cyclades: Mykonos (Paros, Naxos or Syros can be also chosen with 300 Euro extra fee). For Sporades or Ionian, we provide private transfers from Athens Airport to the yacht and back (included on the Saturday). If you wish to include Santorini in your itinerary (extreme South of Cyclades), add 750 Euro extra-fee. Basic beverages on the bar (self-service open-bar include soft drinks, local wine and beers and also ouzo in reasonnable quantitites) you are free to have a drink when you want and you can bring or ask the crew to buy for you any bottle you want on the market price. This contribution is 300 Euro per adult, 150 for children under 12, 220 for 12 to 18, this is for the whole week. 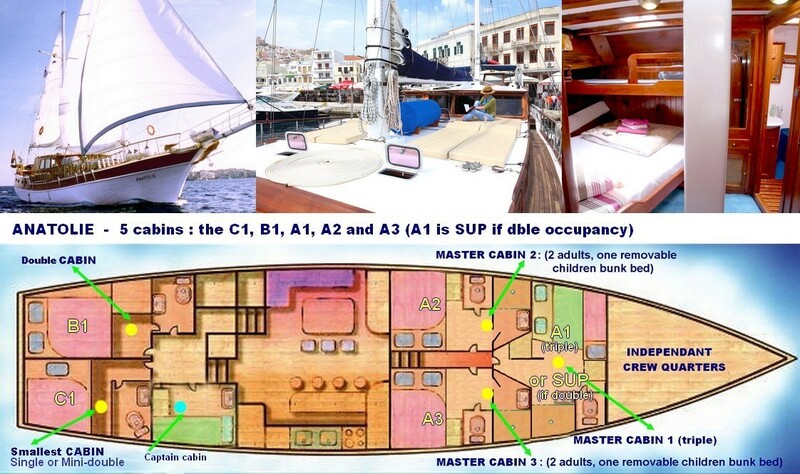 Minimum contribution (even if you hire the yacht for 2 persons) is based on 5 adults for the ANATOLIE and 6 adults for the SYROLANA or KAPETAN KOSMAS. VAT (is actualy 12% of the total: renting+expenses), and crew gratuities to give in the end of the cruise (normal base: 7 to 10%). You will have then only the dinners on shore expenses to add. Cancellation insurance can be included by your credit card payment (check with your Bank), but is often long and complicate. We advise you to take an online travel and cancellation insurance and then pay by wire Bank to Bank without extra fees. This is the link for an insurance where we are referenced, if you live in Europe : insurance. Boarding usually begin's at 5:00pm the first day and final docking is at 9:00am the last day (example for 7 days beginning the Saturday : boarding the Saturday at 5:00pm and leaving the yacht the next Saturday at 9:00am). You can also board the Sunday morning and the yacht leaves immediately. The itinerary is flexible, according to your wishes before and during the cruise. The captain validates the itinerary according to security imperatives, the weather and the return date. These yachts are "fifty", means to use sails with engines. Sails give stability and security when there is strong wind, but is rarely possible to use only the sails. On private cruise, if you do not have priority on the itinerary, then is possible to use more the sails if the wind allows it. Air-conditionning on the cabins is working when there is enough power on the shore, and even we have a special system to run it with less power, there is many harbors in Greece not well equiped. We do NOT run the generator all the night for air-conditioning like some yachts are doing, polluting their neighbours all the night. On private cruise we can choose places well equiped if it is more important for you than the itinerary. Option 1. "Bare boat": all tasks are carried out by our guests. Option 3. "With Skipper, hostess and sailor(s)", 3 or 4 crew in total: You do not have to do the shopping, preparing meals or doing the dishes. Option 4. Yacht with full crew and "hotel service": Additional crew members are dedicated to passenger's service and other clean the boat during all the week. A yacht of this type has usually at least 6 crew members and the weekly price varies between 30,000 and 300,000 Euro for a group of 8 to 12 passengers. It is possible to find cheaper in Egypt or Turkey. We offer the option number 3, with a family atmosphere on board. This means that you put your feet under the table, that the skipper is responsible for navigation, but no one is at the service of anyone, or everyone can be on the service to everyone when needed : team spirit. There are currently no cabin and hotel service and, in one week, each one will probably have the opportunity to put a little "hand dough" on various aspects of life on board (even to launch a drink). If one is used to cruise ships with a whole part of the crew for passenger's service and expects the same thing, better to choose then a cruise ship or hire a yacht with at least 5 crew members. Our formula has advantages (small group, "as his own boat," access to small coves and fishing villages, authenticity), but everyone can have a small participation and there is no "hotel service". You can download the legal conditions of our charters here. 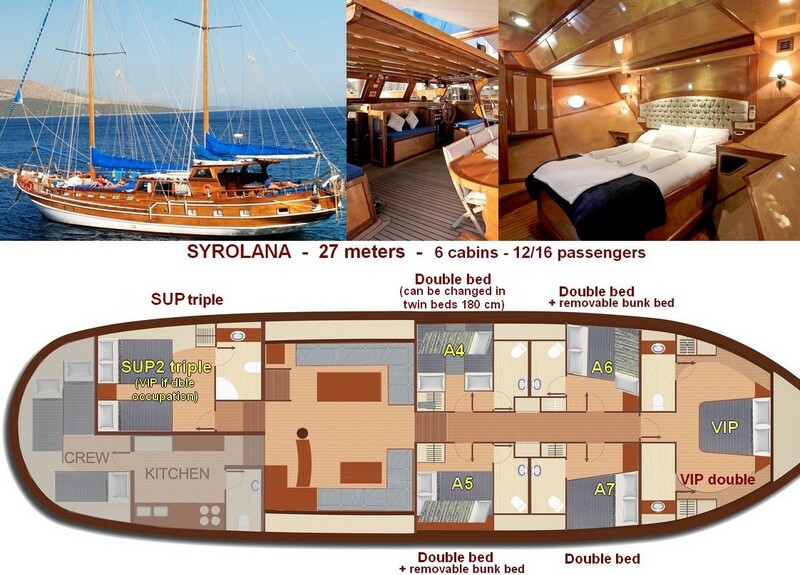 Choose dates and a yacht (Kapetan-Kosmas, ANATOLIE or SYROLANA), and the number of persons in your group. You will receive a confirmation by email in the following 24 hours or immediately by phone. We give you a 48 hours option to allow you to check your flights before confirming and paying a deposit. 2. To confirm your booking you have to pay a deposit of 1/3 if you wish to proceed to 3 payments or half if you want to do only 2 payments. Note that less than 8 weeks before departure you have to pay all the amount to secure your booking. An easy way to pay is by Electronic Bank Transfer click here for the information you will need to give to your bank. If you want to pay by credit card for insurance reasons you can use our PayPal link which accepts all cards but in this case you have to add the fees of 4 % of the amount outside of Eurozone, 3% inside of Eurozone (minimum constated with the currency exchange : it is a shame !). This means that rather to send 5000 you have to send 5200 if you are outside Eurozone, or 5150 inside Eurozone. We invite you to see our references and read passengers reviews : follow this link.